Ros and Andy are please to announce the publication of their new edited book (along with Tarek Virani) on Creative Hubs. 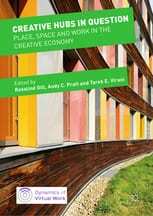 The book arose out of the AHRC research project on creative hubs in London, plus research Andy, Tarek and Janet Merkel did with the British Council on Creative Hubs, and as part of Ros’s EU networking grant on the dynamics of virtual work. It is also another book in a successful series that Ros is series editor for (with Ursula Huws). Ros and Andy are very pleased that so many current and former CCI staff are involved in the book: Janet, Jo, and Marisol, plus Cecilia Dinardi. The book is dedicated to the sad loss of Debbie Dickinson. Full details of the book are to be found here. A book launch is being arranged on May 14th at Queen Mary University of London. Creative Hubs in Question discusses creative hubs in relation to debates about creative cities, co-working spaces and workers’ co-operatives. Featuring case studies from Argentina to the Netherlands, and Nigeria to the UK, the contributions address how hubs are situated in relation to projects of equality and social justice, and whether and in what ways they change the experiences of the creatives who work in them.